3DPointLogic Quick Start Guide – Solv3d Inc.
Download and run the latest version of the 3DPointLogic installer from https://s3.amazonaws.com/3dpointlogic/3DPointLogic%20Setup.exe. 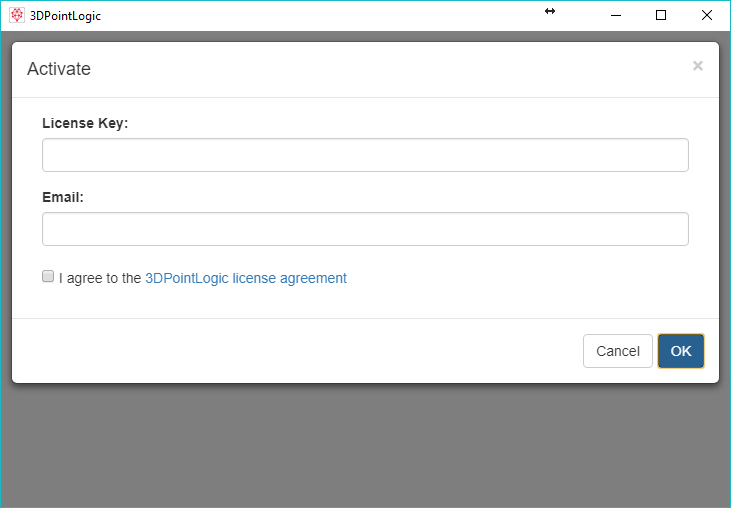 A dialog may appear prompting you to confirm that you wish to install 3DPointLogic. Click Yes. The installation wizard will then install 3DPointLogic to your computer and create a desktop icon. To activate 3DPointLogic, you must have a 32-character license key. If you have lost your key, or are interested in purchasing 3DPointLogic, please contact support@solv3d.com. If you would like a trial of 3DPointLogic, visit 3DPointLogic Trial. 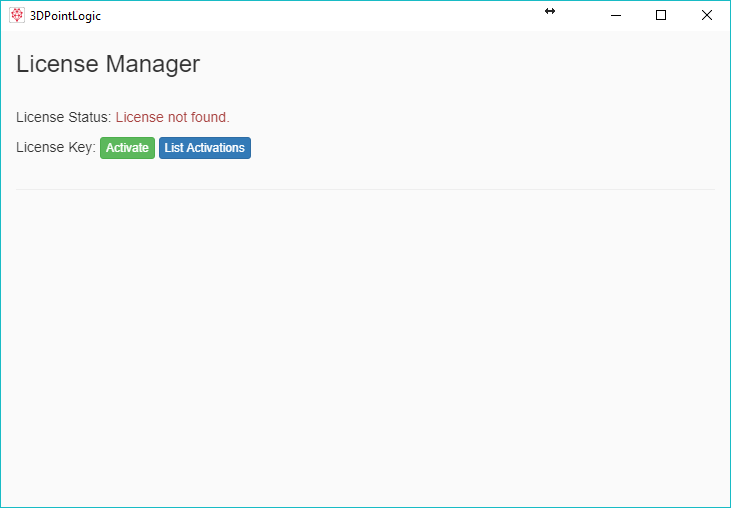 To open the license manager, click “License” -> “Manage” in the top menu bar. 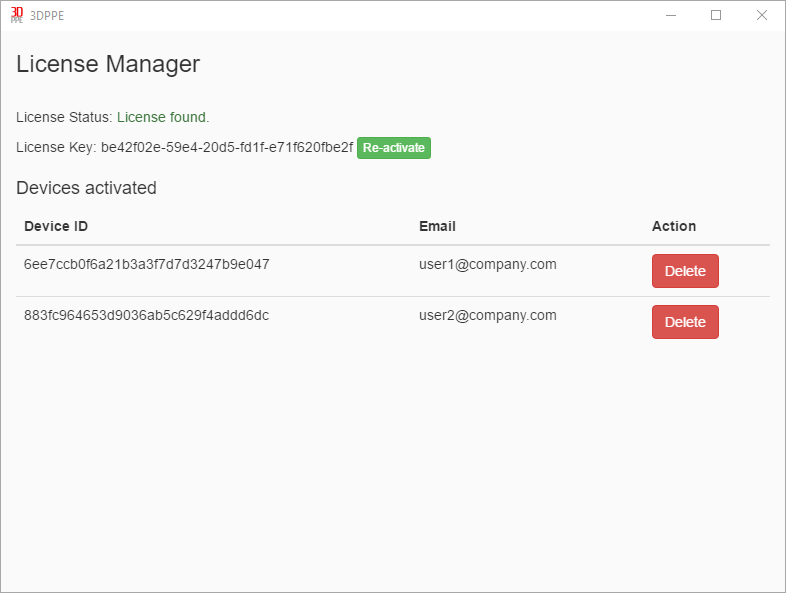 The license manager will open in a new window. After a few seconds, 3DPointLogic will be activated, and a list of all currently activated devices associated with your organization will be listed. 3DPointLogic is divided into three major sections: the tools list, the workflow area, and the workflow state buttons. The tools list is located on the left side of the window, and contains all of the tools which are included with 3DPointLogic. To learn more about each tool, click on the “i” icon to the left of each tool name. The workflow area is located to the right of the tools list, and takes up most of the window. It provides a space to organize tools for various processing jobs. 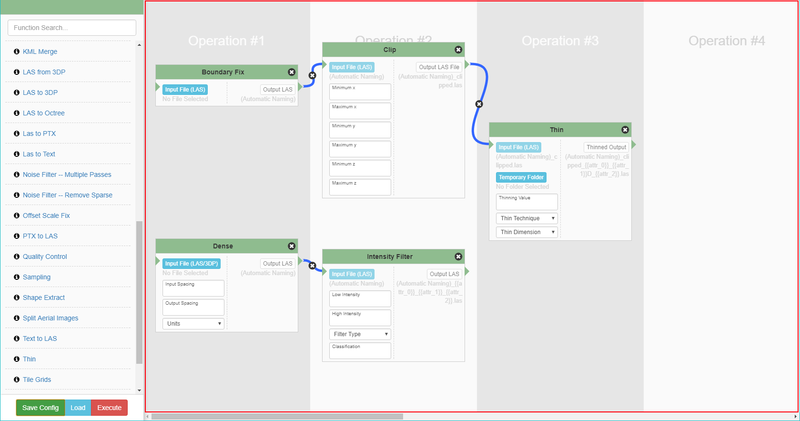 It is divided into different sections, labelled as “Operation #x,” so that tools can easily be configured to run in succession, allowing the easy visualization of even the most complex workflows. By default, the workflow area will be empty. To get started, simply click on the tool which you wish to run. The tool will then appear in the first operation section, and from there it can be dragged right or left to whichever operation section you wish. Up to a maximum of ten sections may be used. Once two or more tools are included in the workflow, they can be linked by clicking the output arrow of one tool, then clicking the input arrow of another tool. Keep in mind that all linked tools must go from left to right. 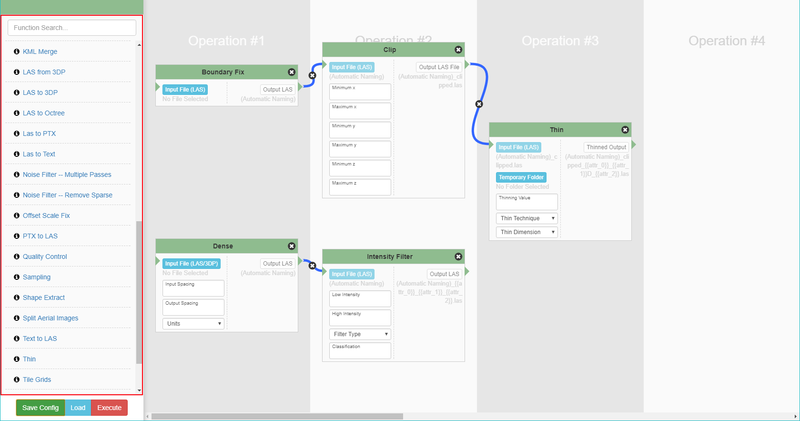 For example, it is possible to link a tool in Operation #1 to a tool in Operation #2 or anything past that, but it is not possible to link a tool from Operation #2 to Operation #1. The workflow state buttons are located in the bottom left of the window, right below the tools list. They provide functionality for saving, loading, and executing workflows. If you have various tools and links arranged on the workflow area which you would like to save for future use, simply click “Save Config.” This will bring up a window prompting you to name and save a “.3dc” file. This file may then be used at a future time to reload your workflow. 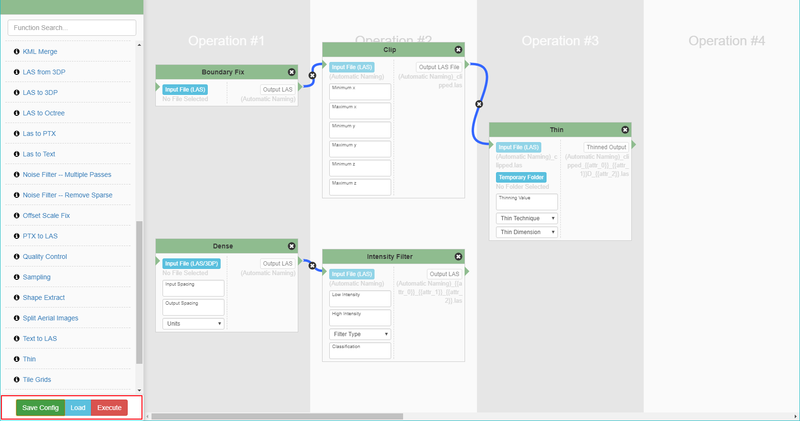 To reload a previous workflow, click “Load” and navigate to the “.3dc” workflow file which you would like to load. 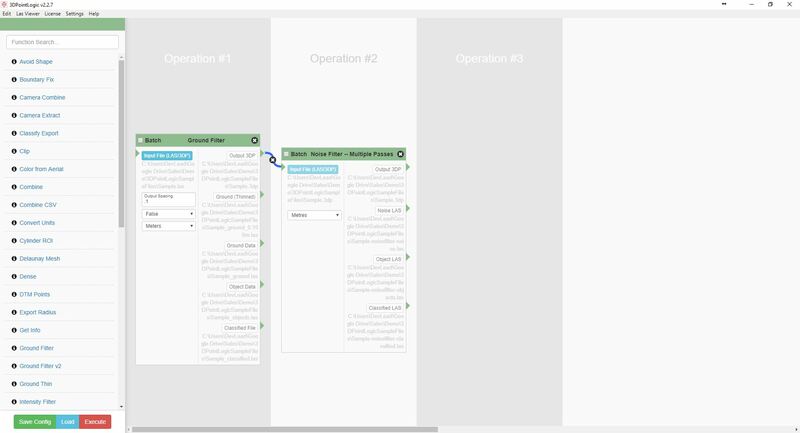 The tools and links will then appear on the workflow area. 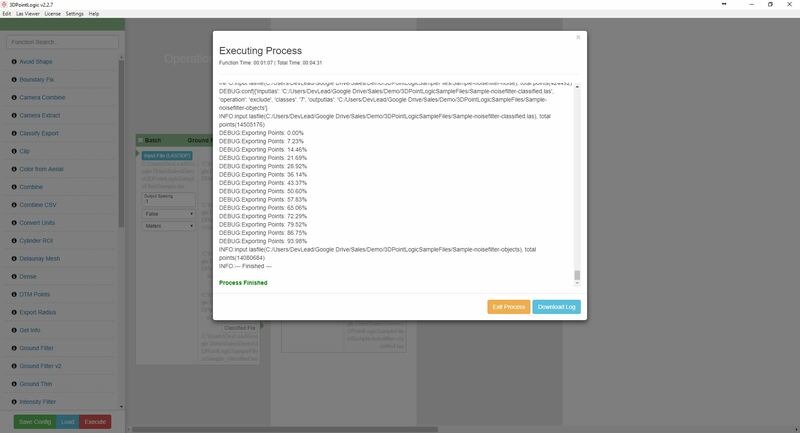 Once your workflow is all setup for the files which you wish to process, click “Execute” to start the tools. Please note that this may take some time depending on the tools which are in the workflow. 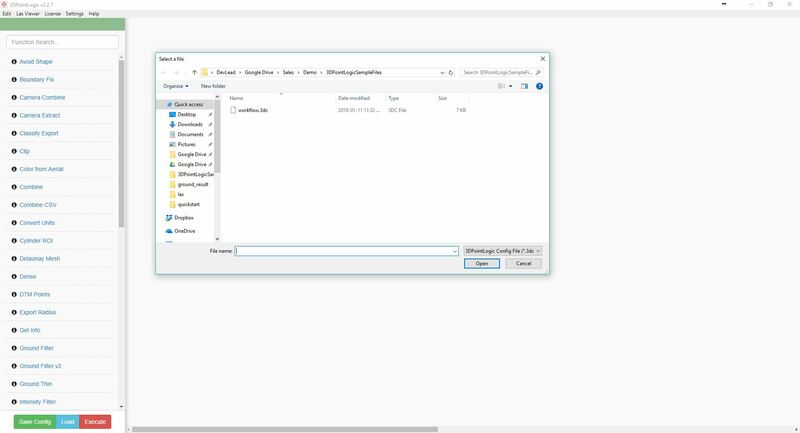 This tutorial will take you through a basic use-case of 3DPointLogic – Separating ground/not-ground in a LAS file and removing noise – while also learning the basics of working with workflows. For additional tutorials, please visit the 3DPointLogic Tutorials. Select the “Download Files” button below to download a zip file containing a sample LAS file and workflow. Once downloaded, extract the zip file. Your 3DPointLogic workflow area should now contain two tools: Ground Filter and Noise Filter — Multiple Passes, with the output 3DP file from Ground Filter being used as the input file for Noise Filter — Multiple Passes. The Ground Filter tool will look at the file and classify each point as either ground or not ground. The Noise Filter — Multiple Passes tool will then classify points which change location between different scans as noise, thus removing artifacts such as cars and dust. 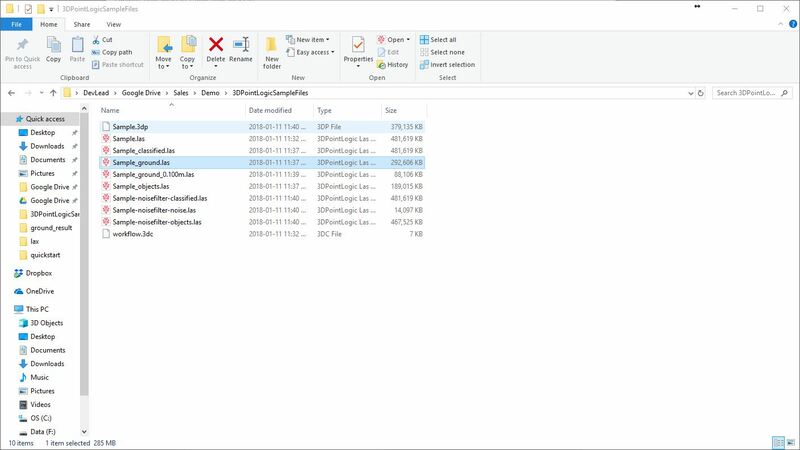 Sample.3dp – A proprietary file format used for storing point cloud data, similar to a LAS file. Sample_classified.las – The input LAS file with every point classified as ground or not-ground. Sample_ground.las – Only the ground points from the input LAS file. Sample_ground_0.100m.las – Only the ground points from the input LAS, thinned so that there is a point roughly every 10 centimetres. Sample_objects.las – Only the non-ground points from the input LAS. Sample-noisefilter-classified.las – The ground classified LAS file with all noise classified as noise. Sample-noisefilter-noise.las – Only the noise points from the ground classified file. Sample-noisefilter-objects.las – Only the non-noise points from the ground classified file.